Russell T. McCutcheon, who came to The University of Alabama’s Department of Religious Studies as its Department Chair in the summer of 2001, was trained at Queen’s University (Kingston, Ontario) and the University of Toronto, where he received his Ph.D. in the academic study of religion in 1995. He came to the U.S. from Canada in 1993, to teach full time as an Instructor at the University of Tennessee, Knoxville (1993-96); from 1996 to 2001 he was an Assistant and then Associate Professor at Southwest Missouri State University (Springfield; now known as Missouri State University). 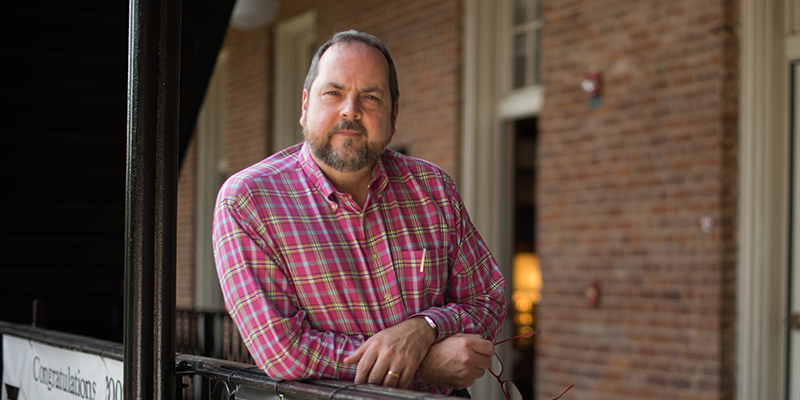 Since 2005 he has held the rank of Professor and, in February 2018, received the rank of University Research Professor from the University of Alabama’s Board of Trustees. He stepped down as chair at the end of the 2008-9 academic year (after serving two terms) and, in August of 2013, he was reappointed to the role of department chair; in 2018 he was appointed by the Dean of the College of Arts & Sciences to another 5 year term. In the Spring 2018 semester, he was awarded the rank of Distinguished Research Professor by the University of Alabama Board of Trustees. His areas of interest include the history of scholarship on myths and rituals, the history of the publicly-funded academic study of religion as practiced in the U.S., secularism, theories of religion, as well as the relations between the classification “religion” itself and the rise of the nation-state. He has written a wide number of books, including his first, Manufacturing Religion (1997) and Studying Religion: An Introduction (2007), as well as publishing a several collections of his own essays–with A Modest Proposal on Method (2015) and Entanglements (2015) being among the more recent–while also editing journals and editing or co-editing a variety of resources in the field (such as The Guide to the Study of Religion [with Willi Braun, 2000], Fabricating Origins , Fabricating Identities , and Religion in 5 Minutes [with Aaron Hughes, 2017]). Forthcoming in 2018 are two new collections of his own essays: “Religion” in Theory and Practice (Equinox) and Fabricating Religion (Walter de Gruyter) as well as another book co-edited with Braun, Reading J. Z. Smith (Oxford University Press) He is also beginning work, for Walter de Gruyter, of a follow-up edited anthology to complement Jacques Waardenburg’s Classicial Approaches to the Study of Religion as well as preparing a new edition of his intro book. Also, he is the series editor for Religion in Culture and Critical Categories in the Study of Religion (both with Routledge), an earlier series now published by Bloomsbury (Controversies in the Study of Religion), and one of three co-editors of Supplements to MTSR (published by Brill). See his A Good Book episode. McCutcheon regularly teaches large enrollment sections of REL 100 Introduction to the Study of Religion as well as a wide variety of courses and upper-level seminars in the Department (on such topics as theories of religion and the rhetoric of religious experience). In addition, he is a member of the Graduate Faculty. Visit Prof. McCutcheon’s amazon.com author’s page to learn more about his work.